A little more than a year ago, Greg and I had made our first marketing push for RadioTail. The first Portable Media Expo was approaching and though our software was not fully implemented we had a working and tested technology for inserting audio spots into MP3’s. Instead of trying to wrap up a buggy Beta to demo, we tried something completely different. I don’t remember who’s idea it was exactly, but after a bunch of brainstorming (and giggling) we came up with SELL OUT BIG TIME. The idea was by being as sarcastic as possible we would try to dispel the myth of taking on advertising being equivalent to selling out. 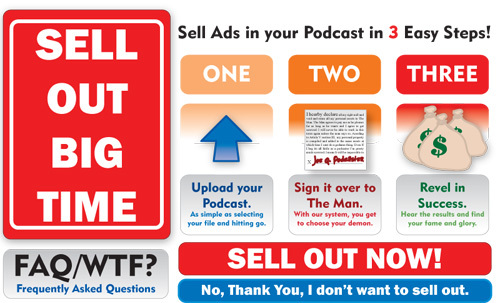 In one week of 20 hours a day, I churned out selloutbigtime.com (no longer active). Users could upload an MP3 and choose to insert one or more of the mock ads I produced into the file. You could then share the link or put it up on our Hall of Shame. We got a good amount of traffic and some great press. The most fun of the whole project was creating the fake spots. Greg and I wrote them up in a Writeboard and I enlisted my friends to help me record them. Voices include, Jeff Bartlett (of The Saturday Saints), Derek Sandhaus, Catherine Mathes, and Myself. I did all the music (which is all original) . All in all I produced and recorded 11 spots in a single 24 hours span. I don’t think I’ll go through that kind of madness again, but it was a hellish blast.